Great Solid Color Fashion Dustruffle Bedskirts in many choices of drop length. PLEASE choose your "drop" length above. Full/Double Size Bed Dimensions are approximately 54 inches wide x 75 inches long. These are standard full bed measurements. A Bedskirt or Dustruffle is designed to hide a foundation or box spring and frame of a bed. Most beds will look finished and proper with a bedskirt. A bedskirt also helps keep dust from under the bed and it hides whatever you store under your bed. A bedskirt or dustruffle needs to be purchased in the correct bed size for fit. A twin, full size, queen etc. Additionally, a bedskirt should be ordered in the correct length or drop. This is going to be approximate but you should carefully measure to get close. You need to measure from the edge of the top of the foundation or box spring to the floor. The most common measurement or drop for a bedskirt is 15". Please choose the correct bedskirt length or drop above. Optional matching bed shams are available! 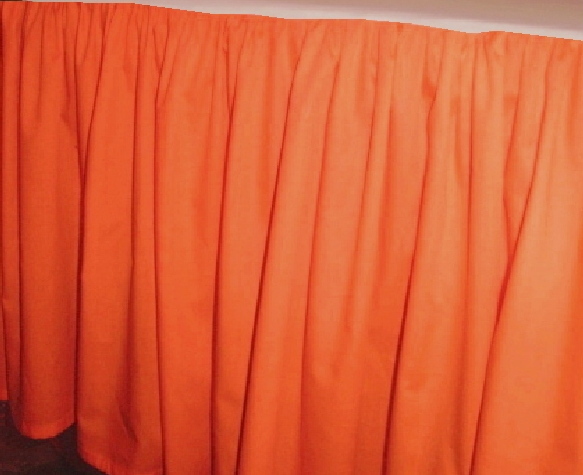 Orange Dustruffle Bedskirt Full/Double Size Easy Care poly/cotton blend. Made in USA.